Enjoy this comprehensive Southern Africa Journey visiting four African nations that are as diverse as the continent of Africa. We'll commence in Namibia, one of the world's last unspoiled wilderness destination. 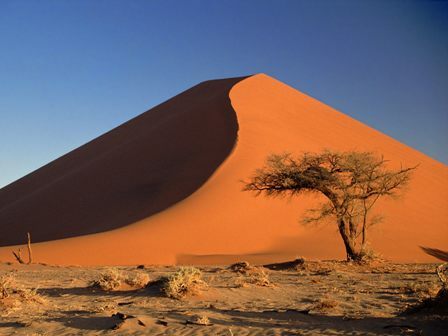 Travel deep into the ancient Namib Desert, a vast and barren landscape to view some of the worlds largest sand dunes. Then fly to Cape Town considered one of the loveliest coastal cities in the world with the landmark Table Mountain. 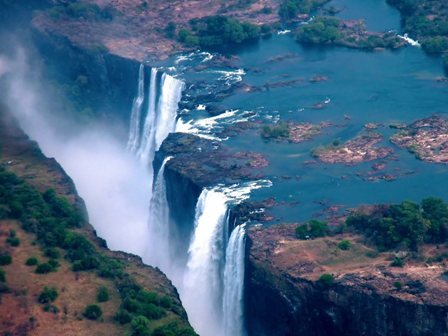 Your journey takes you to Zimbabwe's Victoria Falls, “The Smoke that Thunders” where a mile-long curtain of water plunges 328 feet down a sheer cliff. Then travel to Botswana, home of the famous Chobe National Park for a safari river cruise and game safari. One night at Chobe National Park in Botswana for a safari cruise and game drive. US Citizens require a passport valid for six months beyond travel dates and a Zimbabwe Visa. In the vast arid space of Northern Namibia lies one of Southern Africa's best loved wildlife sanctuaries. Etosha National Park offers excellent game viewing in one of Africa's most accessible venues. Zebra and springbok are scattered across the endless horizon, while the many waterholes attract endangered black rhinoceros, lion, elephant and large numbers of antelope. There are nearly 150 mammal species found in the Park. One night in Windhoek in the capital city of Namibia at the Safari Hotel. Two nights adjacent to Etosha National Park at the Etosha Safari Camp. Half Day Game Drive plus a Full Day Game Drive. Visit Okahandja's open-air wood market. Wildlife roams freely at the Okavango Delta and Moremi Game Reserve. Great herds of antelopes, zebra, buffalo and elephants roam the pastures, and lions, leopards, cheetahs and all other carnivores prosper. Enjoy a combination of utilizing open-air safari vehicles and boats in your pursuit of large hippo populations. Your accommodations are at small deluxe safari camps where in the evening the sounds from the Delta are wonderful. Depart on your international flight from New York (JFK) to Frankfurt. Dinner and breakfast are served. Arrive into Frankfurt, Germany in the morning. A hotel room nearby the airport will be available for the day. Tonight board your Air Namibia flight to Windhoek. Early morning arrival where you will be met and transferred to your hotel. Windhoek is the capital and cultural heart of Namibia and be surprised by a taste of Germany as in 1884 it became a German protectorate called South West Africa, and then a German Colony in 1890. Enjoy a full day of leisure where you will witness the colonial heritage in the city's German architecture. Overnight at the Safari Hotel. Arrive early this morning into Frankfurt for your onward connection to New York City, arriving at JFK in the early afternoon. Early morning arrival into Windhoek where you will be met and transferred to your hotel. Windhoek is the capital and cultural heart of Namibia and be surprised by a taste of Germany as in 1884 it became a German protectorate called South West Africa, and then a German Colony in 1890. Enjoy a full day of leisure where you can relax or purchase an optional tour of Windhoek. Overnight at the Safari Hotel. Arrive this morning at Frankfurt airport for a convenient connection for your flight backto the USA.